Weather applications are very important now these days, because you don't have an idea what the atmosphere is going to be in the next day. So these ios weather apps helps you to make your days better for knowing forecast faster. You can easily see the temperature outside, features auto enables location, weather climate in your iPhone 5 or upcoming iPhone 6. If you are finding to download weather apps than this is the right place, you can find the best. Not only is Yahoo Weather entirely free, it’s also a serious candidate for best overall weather apps on any platform. 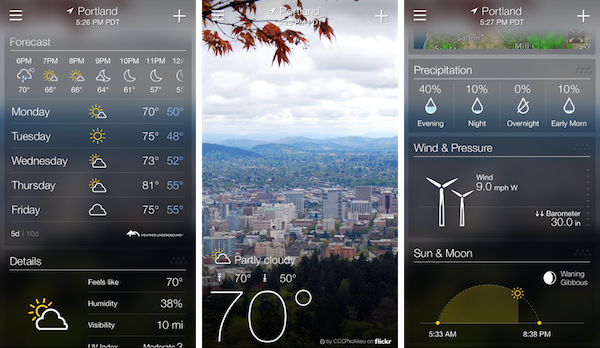 Featuring gorgeous Flickr backgrounds based on your location, the app provides five and 10-day forecasts detailing temperature, wind speed, humidity, and more. It’s also quicker than most weathers apps, devoid of ads, and includes a chart for viewing all of the sunrise and sunset times in your area. 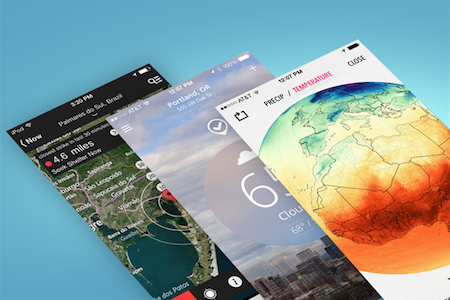 Sky began as a Kickstarter-funded project though it has quickly become one of the top weather apps for iOS. It has embraced the “less-is-more” trend and gives users up to the minute current forecasts. Crucial for finding out if it’s snowing or raining, Dark Sky isn’t flashy but it is easy to use. Because of its $4 price tag, you won’t find ads clogging up the interface, which is a pleasant departure from other weather apps. 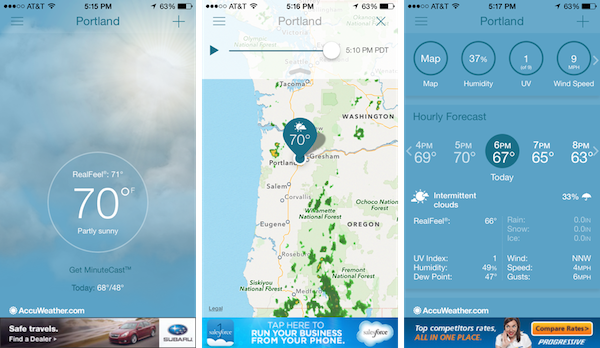 The weather Channel’s mobile application has nearly everything you want in a weather app. It finds your current location with ease and displays local pictures behind its pinpoint accurate weather readings. You’ll have hourly, five days, and 10 day forecasts just below your city’s water and there’s even a useful pollen index to track allergens. 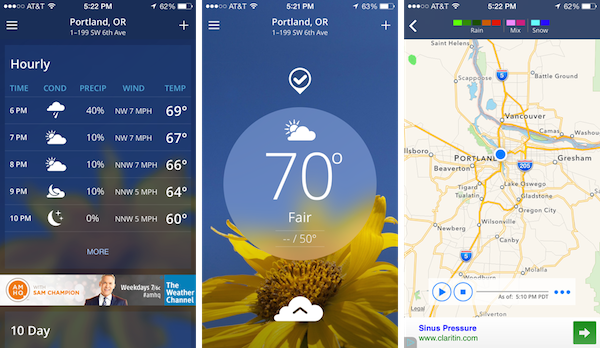 Its premium version, Weather Channel Max, is $4 though the free version is all you need. 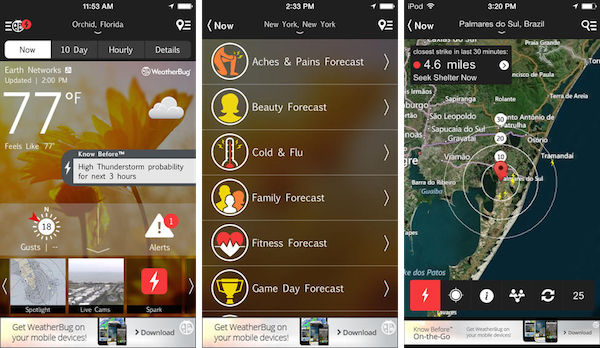 AccuWeather’s weather application provides users with many forecast options including hourly, daily, and weekly information. You’re given the option of uploading any of the forecasts into your phone’s calendar and get alerts for incoming snow or thunderstorms. AccuWeather also provides information on how the weather conditions will impact outdoor activities. 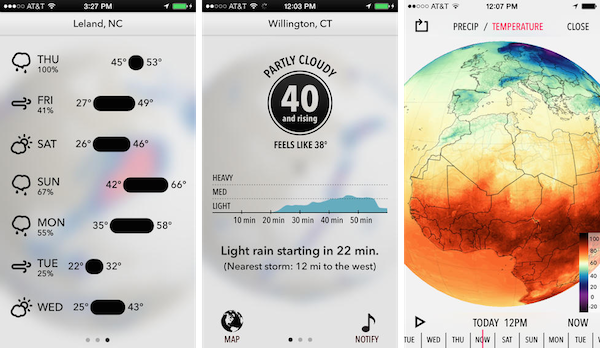 Weather Pod provides a unique weather experience utilizing several swipe gestures. Swipe up for daily astronomy and almanac statistics, swipe down for live weather stats, swipe right for weather alerts and nearby storms, and swipe left for your 7-day forecast. The app’s background also changes depending on your location’s current weather conditions. With Weather Bug’s application you’ll have an exceptional amount of data available to you in one free app. You’ll get storm alerts, wind levels, sunset and sunrise times, and an hourly and 10-day forecast. Some locations feature the ability to view live cameras and you’ll even get updates on health information during cold and flu season. 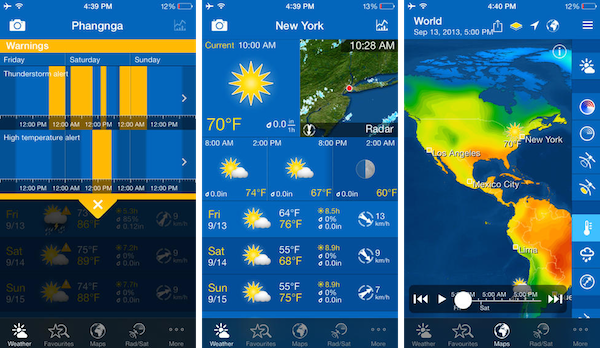 Weather Pro is a popular app in Europe, though it’s equally as impressive stateside. Featuring 7-day forecasts, satellite and radar images, and skiing and beach forecasts, Weather Pro has everything you need in a weather app. It even provides up-to-the-minute weather alerts to let you know exactly when a storm will hit home. Swackett is an off-the-wall weather app which presents its weather information via a cartoon-like infographic. 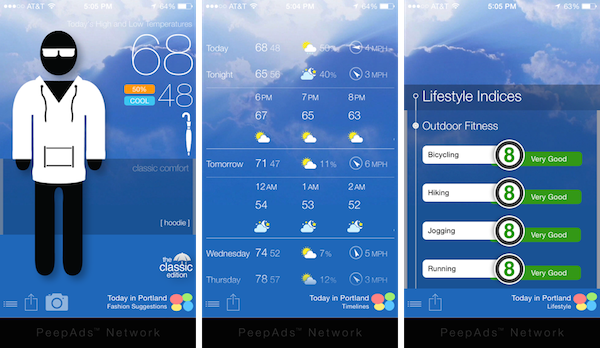 The app features avatars called “peeps” who are wearing ideal outfits for the day’s current weather. It also provides a score rating for outside activities; the higher the rating the more likely you are to do said activity. 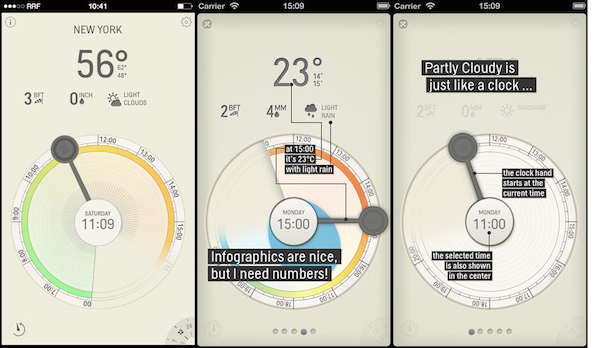 Party Cloudy’s interface is like the face of an analog clock featuring a moving hand which moves throughout the day depicting various weather activities. The colors along the edges change for expected temperature shifts, and blue rises and falls with impending rain forecasts. Though lightweight, Party Cloudy has a lot of weather data in a user friendly format. 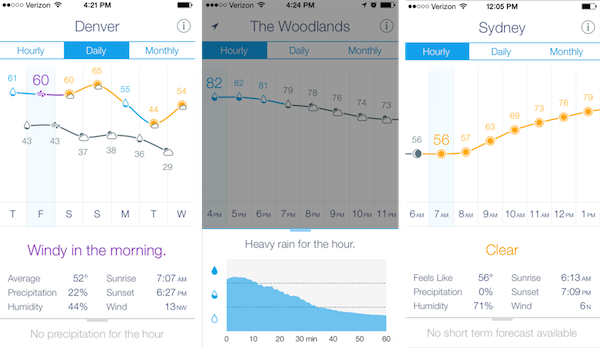 Weather Line is a weather app for graph junkies. It charts out its hourly, daily, and monthly weather forecasts in easy to read graphs which quickly give you an idea of upcoming trends. Weather Line integrates Dark Sky’s rain prediction feature which essentially gives you two weather apps for the price of one.